The BCS Professional Series offers additional power and versatility. Built for a wider range of attachments, the Professional models feature differential wheels that let you “turn on a dime.” They also include differential lockout to provide positive traction when needed. Models 739 and above feature three working speeds in both directions. Models 749 and up have individual wheel brakes on each handlebar. PowerSafe (PS) models 739, 749 and 750 differ from the standard models in that they have a hydro-mechanical “wet” clutch, designed for longer clutch life and smoother shifting. Financing is available on all tractor models with credit approval. The 749 PowerSafe features a third working speed in forward and reverse, differential drive with lockout, individual wheel brakes and can operate a wide range of attachments. Prices listed below are for the tractor only (without attachments). Our most popular walk behind tractor, the 853 has enough horsepower to power nearly all the BCS implements and features a third working speed and a fourth transport speed for rear-mount (tiller) mode. Like all professional series tractor models, it includes a differential drive with lockout and individual wheel brakes for greater maneuverability and is compatible with a wide range of attachments. 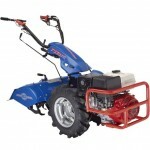 Prices listed below are for the tractor only (without attachments). The Model 852 is a versatile tractor, powered by a Honda GX390. 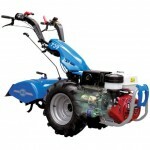 It features a third working speed combined with a fourth transport speed for use in front-mount (mower) mode. 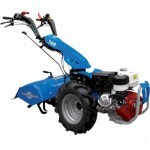 Like all professional series tractor models, it includes a differential drive with lockout and individual wheel brakes for greater maneuverability and is compatible with a wide range of attachments. Prices listed below are for the tractor only (without attachments). Powered by a Honda GX390 engine the 750 can power the largest 33" BCS tiller. The 750 is designed for the most demanding commercial applications, with features that make it especially well-suited for commercial market farms and nurseries. Prices listed below are for the tractor only (without attachments). The PowerSafe 739 adds a third working speed in both forward and reverse directions enabling you to mow at 2.7MPH. It also features differential drive with lockout and can operate a wide range of attachments. 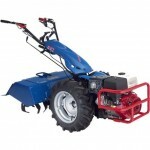 Prices listed below are for the tractor only (without attachments). BCS model 732 is the most economical of the Professional Series. It has more features, more horsepower, and more versatility than the Harvester series models. It also features differential drive with lockout and can operate a wide range of attachments. Prices listed below are for the tractor only (without attachments). I wanted to let you know that I was pleasantly surprised to find the parts waiting for me at the post office yesterday! And I was again pleasantly surprised to find that you had assembled everything. Thank you for the fine service. BCS was a Game-Changer for Our Farm! 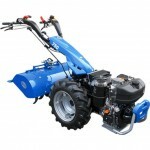 Special discounts are available on all Professional Series tractors and implements. Please call us for further details.